A president who looks like the human equivalent of a cheesy puff has made the United States the most divided it has been in decades. On both social and political levels, Americans are torn apart while racists and fascists parade in the streets, with some even getting positions in our country’s government. It’s a strange, scary and – at times – fascinating era in history. It’s only fitting that Canadian anarcho-punks Propagandhi are putting out their seventh album, Victory Lap, on Sep 29 via Epitaph Records. There’s a musical evolution taking place with more melody added to the prog-punk heavy riffs. 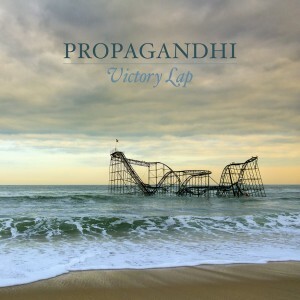 Victory Lap marks a few changes to Propagandhi’s roster. Founding members Chris Hannah and Jord Samolesky still remain on guitar and drums while bass guitarist Todd Kowalski has been with the band since 1997. David Guillas plays guitar on the album, but he ended up backing out of the band’s touring duties in 2015 with Sulynn Hago taking his place. There’s definitely an upbeat vibe to contrast with lyrics that examine misery and oppression. Maybe it’s done on purpose to provide a triumphant sense of perseverance? Most likely, but the band obviously would have to confirm that themselves. “Failed Imagineer” is one of those tracks that provide the upbeat vibe mentioned earlier, and the meaning behind it supports veterans who have been hardened by war, the chorus is a bit catchy as well. Analogizing the xenophobic anti-immigration stance of the current presidential administration to animals being kept in a zoo, “Adventures In Zoochosis” is an harmonious look at cognitive dissonance; when I say harmonious, I mean that Hannah’s and Samolesky’s voices merge together at multiple instances. With a thrashing tone, “In Flagrante Delicto” is a rager that’s a testament to Propagandhi’s trademark intensity. As part of their upcoming North American tour, Propagandhi will be playing a stacked show at The Middle East in Cambridge, MA on Oct 21 with Iron Chic and Heartsounds. While you’re there, grab a copy of Victory Lap. It’s a raucous and clever record that’ll make you think about what’s happening beyond your doorstep.